Before molten resin can fill the part cavity, it must first wind its way from the sprue (the inlet of the mold) to the gate(s). In between those two end points, the molten resin is distributed through channels, called the runner system. Think of the sprue as the highway, the runners are streets and the gates are driveways to the individual homes. Runners must be bigger than the gates they feed because the runners must be capable of delivering resin flow to every attached gate. In some cases, multiple parts can be fed by one runner. To complicate matters further, a single part can have more than one gate, thus requiring more runners. 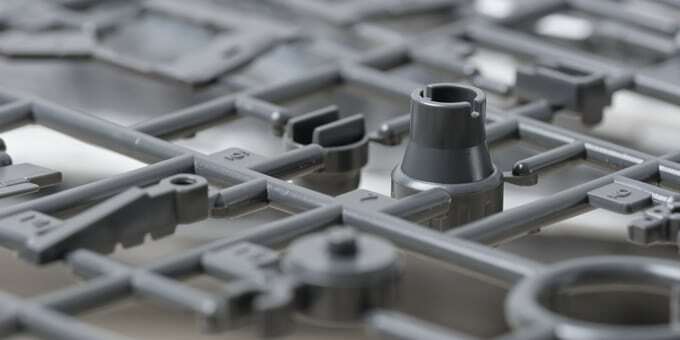 In multi-cavity or family molds, there’s more than one part per cavity (but still one sprue). Thus, the runner system (the distribution network of molten resin from the sprue to every gate) can be quite large and labyrinth-like. Cold Runners: these runners are filled at the same time as the part cavity. The resin in these runners is also cooled at the same time as the part. This means that the runners, gates, and sprue often get ejected as one piece (unless you are using automatically trimmed gates after each completed cycle). The part is then either manually or automatically separated from the gates and runners. Runners are tossed as scrap, except in the cases where that resin can be reground and reused. Process sheets should dictate the allowable percentage of regrind allowed back into the injection molding process. Hot Runners: The runner channels are kept hot by heating elements and thus never solidify. The section of the mold that contains the hot runners is kept thermally insulated from the section that houses the cavities (since one of the main jobs of that part of the mold is to cool the resin). When it’s time for the part cavity to be filled, valves open up and allow the resin to flow into the gates and cavity. Then those valves close and the resin solidifies in the mold. Each type has its advantages and disadvantages. Molds with cold runners have a lower upfront cost, are simpler, and easier to maintain. The main drawback for cold runners is the problem of wasted plastic mentioned earlier. Although it is true that the runners can often be reground and reused on-site, this isn’t true for all plastics. For the expensive resins, the cost from this waste can be significant, especially if the runners are large or numerous, like the multi-cavity setups mentioned above. Hot runners have several advantages over cold runners. In addition to less scrap due to plastic in the runners never solidifying, the cycle time is often shorter since you don’t have to wait for that section of resin to cool. Shorter cycle time means lower price per part. Hot runners can also help prevent sink marks. They are however, more expensive to machine, more complex, have higher maintenance costs, and require precise temperature control and control of their valve timing. This is why hot runner systems are not recommended for small production runs, as they can cost anywhere from $2,000 to more than $100,000. Another disadvantage is the fact that some resins are temperature sensitive and may not be compatible with this process. Which One is Right for Your Part? Like so many other decisions in injection molding that can increase cost, using a hot runner system can more than pay for itself if you’re making hundreds of thousands or millions of parts. The higher upfront costs are made up by the reduction in scrap and the shorter cycle time. For prototype and smaller production runs, however a cold runner system may actually make more economic sense. This is especially true if you’re using a cheaper resin, the runner system isn’t that big and you’re using automatically trimmed gates, and the design of the cold runner system is simple. The decision to use a hot or cold runner system should be made in close consultation with your injection molding contract manufacturer. You can take advantage of their experience, knowledge of their machines, and in-house engineering talent, thus avoiding the potential to be locked into bad design choices. Whether you’re weighing hot vs. cold runners for your mold or any other design decision, Providence has the engineering staff, CAD tools, and experience to make sure your injection molding project runs smoothly from design to delivery. Contact us at today to discuss if a hot runner system is right for you. Because of the Hot Runner System is cost from couple thousand dollar up to more than hundred thousand dollar. Therefore it is not recommend to use for less production. Whether you’re weighing hot vs. cold runners for your mold or any other design decision, Providence has the engineering staff, CAD tools, and experience to make sure your injection molding project smoothly flows (pun intended) from design to delivery.